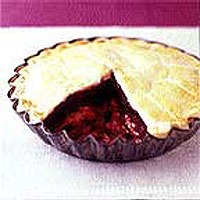 'For lunch, during study courses at Great Missenden College, Buckinghamshire,' writes Sue Caunt, by email, 'they used to serve this fabulous beetroot and horseradish pie. Please share the recipe.' Chef Ron Eaglestone and his team were happy to do so. Roll out the pastry and use to line a 20cm flan dish, making sure that you have enough pastry left over to cover the dish. Spread 1/3 of the horseradish over the pastry, then sprinkle on 1/3 of the grated Cheddar. Add 1/3 of the chopped onion, then 1/3 of the beetroot. Repeat twice, using all the ingredients. Brush the edges of the pastry with beaten egg, cover with a pastry lid and press down the edges to seal. Trim off excess pastry with a small, sharp knife. Brush the top with beaten egg and make a small steam hole in the centre. Bake for 20-25 minutes then leave to cool for 5-10 minutes before serving. This is good with fondant potatoes (potatoes cooked slowly in stock until all the liquid is absorbed), along with parsnips seasoned with lots of black pepper, and savoy cabbage. In the summer, the pie is delicious with minted new potatoes and a green salad.